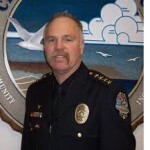 The Grover Beach City Council voted unanimously to make Police Chief Jim Copsey the assistant city manager and chief of police concurrently starting on Oct. 28. Copsey is now responsible for stepping in if the city managers is unavailable, helping with city council agendas, assisting the city manager and working with the executive team. The additional position pays $13,230 a year which increases Copsey’s base salary to $144,192..
City Manager Bob Perrault suggested the change noting that Copsey stepped in for him during a six-week unexpected absence earlier this year, at a time the city was dealing with several projects. “This incidence brought to light the fact that a vacancy in the office can occur without notice and can have impacts throughout the municipal organization,” Perrault said in a staff report. Assuming that GC’s retirement is through PERS, and that the police dept. is on the 2 1/2% at 50 plan (name one dept. that is not on that plan), and assuming that the good chief starting in this line of work when he was 20 years old and works until he’s 55, this will result in a $500/month increase for the rest of his life. This is an abuse of taxpaid dollars. Usually when someone fills in for a higher job class they get paid at the higher classification only during that period for which they filled in. For instance when the Captain fills in for a Police Chief who has left the agency, the Captain is paid at the Chief salary until a replacement is selected. This Grover Beach action adds a new classification and it acts to spike the Chief’s retirement package at age 50. No wonder our Grover Beach streets are in such disrepair. Not the streets in front of property owned by “special people”, such as council members, family, friends or other such,and this will increase their property values or enjoyment while the rest of the city streets crumble. It’s certainly less costly than what they did in Atascadero when they hired a full time assistant city manager. That guy cost the tax payers well over 100K a year plus benefits and even a low cost mortgage financed by the tax payers. I’d say this small bump as compared to a new hire is a reasonable choice. Yes, Muffet, I’m generally also suspicious of such in-house moves and it probably DOES augment the pay which will be used for the pension calculation. Your concerns are very valid. However, the low amount of the pay figure might be a bonanza of savings compared with filing another position, search to fill it, and “perks” supposedly needed to attract a good candidate. The work the Chief performed sounds more like a “stand-in” or fill in. This might therefore be a good common sense move. I don’t know the full details; I’m not a qualified Grover voter. I’m busy hoping to sack GIBSON. I think that most California cities the size and budget of Grover Beach do not have a position of Assistant City Manager especially in these cash strapped days. To have created such a position is a luxury that the taxpayers can ill afford. Like I said, if the Chief is filling in for the City Manager for any extended period tof time then pay him the equivalent of the City Manager’s salary for that period. In essense what the City Council has allowed is to have created another pay classification for a management position and meanwhile our other city infrastructure suffers. Plain and simple ….It is not right !!! If your first statement is correct, the comments to follow are too. However, I am not sure that it is correct — how do you know this? Our neighbor Pismo doesnt have an Asst City Manager, nor does our other neighbor AG. Atascadero doesnt have one either. SLO has one as does Paso but they are much larger then us and have a bigger tax base.